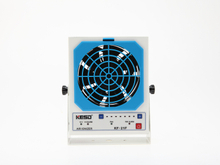 Kesd benchtop ionizing air blower adapts the high frequency AC principle and can remove high electrostatic voltage in one second. This principle can reach 6500Hz ion release frequency, and positive and negative ions alternately generated, the ion concentration covering a wider range, so that it can quickly neutralize the electroscopic charge on the product surface. It only takes 1 second to remove the static among 300mm and 1.5 seconds among 600mm. The ion balance of positive and negative can reach to 10 volts, so that it is called the killer to the static.